Brand New Westendorf TA55 Quick Attach Front End Loader. 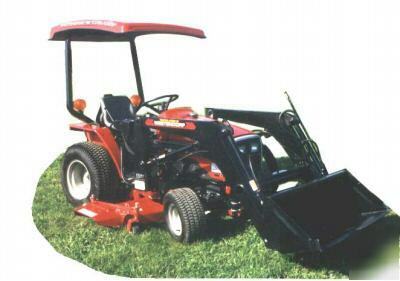 THIS IS A GREAT LOADER FOR ALL 15 to 24HP, 2 & 4 WD COMPACT TRACTORS! Plus, Besides Being a Westendorf Loader, the TA55 has the Outstanding Feature of COMPATABILITY WITH MOST ALL BELLY MOWERS!!!! * A Black TA55 Loader (of course!). * Joystick Controlled Valve & the Valve Mounting Brackets. * Horsepower Range is 10 to 24 HP (2 and 4wd Tractors). * Maximum Lift Height to Pivot Pin is 86". * Clearance with Bucket Dumped is 69". * Reach at Maximum Lift Height is 22". * Maximum Dump Angle is 45 Degrees. * Maximum Rollback Angle is 15 Degrees. * Total Palletized Package Weight With Bucket And Mounting Brackets is 585lbs. Agco Models: ST30X 4WD, 1233 2WD, 1233 4WD & ST30 4WD. Belarus Models: 220 4WD, 2011 2WD & 2045 4WD. Case IH Models: 245 4WD, 255 4WD, 1130 2WD, 1140 2WD, 1120 4WD, 245 2WD & 255 2WD. Cub Cadet Models: 7275 4WD, 7232 2WD, 7233 2WD, 7234 4WD, 7235 4WD, 7260 4WD, 7265 4WD, 7272 2WD, 7273 2WD, 7300 4WD, 7305 4WD & 7374 4WD. Deutz-Allis Models: 5015 2WD, 5015 4WD, 5215 2WD, 5215 4WD, AGROKID 25 A 4WD, AGROKID 25 A/HST 4WD, AGROKID 35 A 4WD & AGROKID 45 A 4WD. Hurlimann Models: - Prince 325 4WD, Prince 325 HST 4WD, Prince 435 4WD & Prince 445 4WD. International Models: 244 2WD, 244 4WD, 254 2WD, 254 4WD, 255 2WD & 234 4WD. John Deere Models: 755 2WD, 755 4WD, 855 2WD, 855 4WD, 650 2WD, 650 4WD, 750 2WD, 750 4WD, 655 2WD, 655 4WD, 955 4WD, 850 2WD, 770 4WD & 790 4WD. Kioti Models: LB2204 2WD & LB2204 4WD. Kubota Models: B6200 2WD HST, B6200 4WD HST, B7200 2WD HST, B7200 4WD HST, B8200 2WD, B8200 4WD, B8200 2WD HST, B8200 4WD HST, B9200 2WD, B9200 4WD, B9200 2WD HST, B9200 4WD HST, L175 2WD, L185 2WD, L185 DT, L225 2WD, B6100 2WD, B6100 4WD, B7100 2WD (Gearshift), B7100 4WD, B2150 4WD, B2150 HST 4WD Bi-Speed, B1550 2WD, B1550 4WD, B1750 2WD, B1750 4WD, B1750 4WD HST, B7100 4WD HST, B6200 2WD, B6200 4WD, B7200 4WD, B7200 2WD, B7200 4WD (Gear Shift), B7100 4WD HST, L225DT 4WD, B1700 4WD HST, B1700 4WD HST Bi-Speed Turn, B2100 4WD HST Bi-Speed Turn, B2400 4WD, L2201 2WD, L2201 4WD, B1700 4WD, B1700 4WD HST Bi-Speed Turn, B2100 4WD, B2100 4WD HST Bi-Speed Turn, B2400 4WD HST, B2410 4WD, B7400 4WD & B7500 4WD. Lamborghini Models: Runner 250 4WD, Runner 250 Jet 4WD, Runner 350 4WD & Runner 450 4WD. Massey Ferguson Models: 1030 4WD, 1010 2WD, 1010 4WD, 1020 2WD, 1020 4WD, 1233 2WD, 1233 4WD, 1205 HST 4WD, 1215 HST 4WD, 1225 HST 4WD, 1230 2WD & 1230 4WD, 1235 4WD. Mitsubishi Models: 160 2WD, 160 4WD, 180 2WD & 180 4WD. New Holland Models: 1310 2WD, 1310 4WD, 1510 2WD, 1510 4WD, 1110 2WD, 1110 4WD, 1210 2WD, 1210 4WD, 1120 2WD, 1120 4WD, 1220 2WD, 1220 4WD, 1320 2WD, 1320 4WD, 1520 2WD, 1520 4WD, 1620 2WD, 1620 4WD, 1715 4WD, 1600 2WD, 1500 2WD, 1500 4WD, TC18 2WD, TC18 4WD, TC21 2WD, TC21 4WD, TC21D 4WD, TC24 2WD, TC24 4WD, TC24D 4WD, 1120 2WD, 1120 4WD & 1215 4WD. Rhino Models: 254 4WD & 184 4WD. Same Models: Solaris 25 4WD, Solaris 25 Hydro 4WD, Solaris 35 4Wd & Solaris 45 4WD. PLUS, we are glad to say this Westendorf Loaders are MADE IN IOWA, USA!! !